The device in the photo above may just have the ability to radically change your next hospital visit. No, it's not a robotic surgery unit (although those do exist). It's not something that shoots laser beams (although it does use light). No, the device, manufactured by a company called Xenex uses ultraviolet light to kill bacteria & viruses. The UV light is actually UVC which is different than UVA and UVB. The A and B wavelengths penetrate the atmosphere and cause skin to tan in response to exposure. C is reflected by the ozone in the upper atmosphere and goes back out into space. Since UVC does not reach the surface of our planet, simple organisms like bacteria & viruses do not have any defense mechanism to protect themselves from it. The Xenex machine produces UVC in pulsed doses that are 25,000X more powerful than those that are produced by the sun. Why would a company create a machine like this and even more important, why would hospitals be buying it? The reason is the term "Noscomial Infection" or HAI (standing for Hospital Acquired Infection). The official definition is: an infection whose development is favoured by a hospital environment, such as one acquired by a patient during a hospital visit or one developing among hospital staff. Such infections include fungal and bacterial infections and are aggravated by the reduced resistance of individual patients. Basically, anytime you are in an environment where your immune system is weakened and you are surrounded by sick people, there is a high risk of catching a bug. The Xenex device kills lots of different kinds of viruses and bacteria including clostridium difficult ( C. Diff) which helps keep patients safer and helps decrease the odds of a HAI. For the second year in a row, the panel at the Pride Technology Expo picked the Ultradent Valo curing light as "Best in Class". The Valo has been my favorite curing light for a while now and with good reason. It is made out of aerospace grade aluminum. There are several grades of aluminum. Aircraft grade is good enough to make planes out of. Aerospace is good enough to make missiles and rockets out of. This curing light is CAD/CAM milled in the basement of Ultradent's state of the art facility in South Jordan, Utah. The device is so durably made that it will withstand 300 drops from a counter top onto concrete. That's right… 300 drops. It is THAT durable. In fact, in a dental clinical environment, I consider it indestructible. It is also a wide spectrum light with an output from 395-480nm. That means it will set every composite currently on the market. VALO Cordless uses a custom, multi-wavelength light emitting diode (LED) for producing high intensity light at 395–480nm, which is capable of polymerizing all light-cured dental materials. This intensity will also penetrate porcelain and is capable of curing underlying resin cements similar to a quality halogen light. VALO Cordless uses VALO rechargeable batteries and a battery charger suitable for power outlets from 100 to 240 volts. The handpiece is designed to rest in a standard dental unit bracket, or can be custom-mounted using the bracket included in the kit. It can also be stored on a countertop or in a drawer. VALO Cordless is equipped with a sensor that registers movement of the light; when the light is not being used, VALO Cordless will automatically go into sleep mode and when moved will return to the most recently used setting. A few years ago, while wandering the booths at the American Dental Association's Annual Meeting, I came across the booth of DentLight. This small company, owned by a gentlemen with an advanced degree in light physics (or some such complicated subject) is located in Richardson, Texas. While a small company, the products they create are anything but small in stature when compared to products from other companies. DentLight makes surgical telescopes, auxiliary lighting systems (like the DentLight Nano, The DOE Oral Cancer Screening Device, and the Fusion Curing Light, among other devices. I've worked with their products over the years in a consultant capacity and I've been impressed with the products I've had a chance to test and evaluate. At the ADA Annual Session that recently concluded in New Orleans, I was contacted by the company as they were announcing the 4th version of their Fusion Curing LIght. Read on for all the details. DentLight Inc., an LED optics innovator in dental device design and manufacturing, is pleased to launch FUSION 4 – the most versatile and powerful curing light. Building on the achievements of its award-winning predecessors, FUSION 4 sets the pace for a new era of high performance smart curing lights. With patented optics and modular design, it delivers a focused low-dispersion beam of 2700 mW/cm2 high power for bulk or 5-second cure and 1300 mW/cm2 pulse power for low shrinkage cure. Small, sleek and well-balanced, FUSION 4 is made of solid aircraft aluminum with drop-proof reliability and ease of disinfection. FUSION 4 upgrades the user interface with an even more impressive, intuitive and multi- color backlit LCD. This small light amazingly displays a digital timer, battery icon, power level, thermal status and has an audible beep for time stamp. The streamlined metal keypad has two raised buttons including a large ON/OFF button for easy activation. Coming with a tacking tip, 9mm tip and 13mm tip, FUSION 4 is the heavy-duty light that dental professionals can count on to save curing time, improve quality and cover all composite restoration applications including fillings, sealants, veneers and crowns. FUSION 4 is not only an ultrafast 5-second curing light but also a multifunctional and versatile light easily upgradable for high-power transillumination (caries/fractures/canals), fluorescent imaging (early cancer detection), and teeth whitening for added profit streams. I've been using Connected Data's Transporter for over a year now. To say I'm impressed with the device would be just a wee bit of an understatement. Recently I learned that the company is going to be releasing the ability to synch all of your data into your own private cloud!!! Sound interesting? I thought so. Read on for all the details! SANTA CLARA, Calif. – Oct. 29, 2013 – When it comes to digital data, nothing is more important to consumers than their photos, videos and personal documents. Keeping them safe, easily accessible from every device, or sharing them with family and friends has always been an expensive and complicated proposition. Until now. Just in time for the holidays comes Transporter Sync, a new and simple way to sync, access, protect and share everything important. The latest addition to the award-winning Transporter family of private cloud storage products, Transporter Sync automatically synchronizes data across your phones, tablets and computers. Photos, videos, documents, music and more can live in your own protected, completely private cloud for a one-time cost of $99 USD – with none of the recurring fees associated with expensive, subscriber-based services. Free iPhone, iPad and Android apps make on-the-go access easier than ever. Transporter Sync allows users to access data from all their devices without moving it to the public cloud. This ensures that everything on Transporter Sync is protected and private giving them full control over who has access to family photos and personal videos. 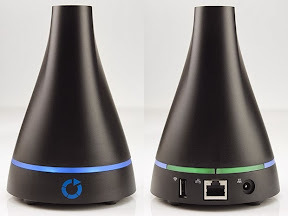 It can be used as a stand-alone device, or with other Transporters to form a powerful private network. Retailing for $99 USD without monthly fees, Transporter Sync works with any standard USB external hard drive. Available from Connected Data, Amazon, B&H Photo, Tiger Direct, PC Mall and Newegg in time for the upcoming holiday season, Sync is the perfect gift for everyone on your list. More information on Transporter Sync visit www.filetransporter.com/meet_sync. Connected Data is focused on providing elegantly designed solutions for consumers, professionals, and small businesses to privately share, access, and protect their data. The Connected Data team consists of the same professionals responsible for the popular Drobo storage array and the creation of the high performance BlueArc Silicon Server. Connected Data is privately funded and based in San Jose, California. For more information, visit www.connecteddata.com. In my time with Advanstar Dental Media, we've covered a variety of subjects. Now we're branching out even more to a site devoted just to the idea of management, no matter if it is for a practice for you, the individual. I had lunch with a friend of mine a while back and he said something that I sill consider profound even though he didn't mean it that way. What he said was, "The first few years in practice you spend time seeing and learning how to deal with all the different clinical aspects of what we do. Then after a while that becomes pretty easy, but about the time clinical becomes easy, management rears its head and I'm not sure management EVER gets easier." To that end, we are launching Dental Practice Management. We do this with the hope that this WILL make the management part easier. The idea is short, to the point articles that make sense but also don't take an entire lunch period to read and comprehend. I'm excited about this as technology isn't just something that happens clinically, it happens in every aspect of the office. Also, like you, I'm a practicing dentist who faces the same challenges as any other clinician and business owner. I look forward to helping you solve the problems we all face… and doing it together! Welcome to general practice management! Our goal with this site is simple: to provide you (whether you are a dentist, hygienist, dental assistant, or office manager) with the information that you need to become more successful, both personally and professionally. There are many aspects to successfully managing a dental practice, from human resources to proper scheduling to marketing… and everything in between. Our goal at DPM is to give you the best advice from the best resources available… and to do it in short articles that can be read quickly. I have worked with dental magazines for almost 15 years and the one thing I constantly hear from dentists is the need for information on how to better run their practices. With that in mind, our team will work with the finest consultants in the market and we will talk to you and your colleagues about what is working in your practice… and what isn't. Working with our sister publications (Dental Products Report, Dental Lab Report, and Modern Hygienist), we're going to be able to give you a well-rounded look at every angle for success in the dental practice. Additionally, you'll be able to read “secrets of success” from dentists and team members throughout the country and learn how they have grown their practices and made them prosper. I encourage you to go ahead and dive into this site. Check out our articles, videos, and webinars. There is a lot of great information waiting for you… and much more to come on a daily basis. We're glad to have you here! Could Aspirin Aid in Decreasing Periodontal Pocketing? A story that was originally out in 2012, made the rounds again here in 2013 (the power of the Internet). The story came from a study published in 2012 by the Australian Dental Journal. The idea is/was does a small daily dose of aspirin cause a reduction in periodontal pocketing? The study was comprised of 2 "aspirin" groups and one control group. The aspirin groups were divided into one group taking 75mg per day while the other was taking 150mg per day. The total number of these patients was 152 individuals. The control group was 146 who did not take any aspirin at all. Comparisons were made between all 3 groups. It was noted the aspirin group averaged about .25mm less pocket depth. Which was statistically significant, but I would leave it to statisticians to determine if it is clinically significant. There is a difference between the two and I'm not sure where that differentiation lies. The study was cited on the worldental.org website & I did notice some info on the site that I would take issue with. I'm not sure, but some of the wording seemed to indicate the site might be run by a layperson or laypeople, which , in that case, would explain the odd terminologies. While doing a little research on PubMed, I found what I think to be the original Australian study (no authors were mentioned on the worldental site). The conclusions on PubMed stated "The results of this study suggest that low dose aspirin may reduce the risk of periodontal attachment loss. This hypothesis needs to be tested by larger sample sized prospective cohort studies." My point in listing the conclusion is that the authors suggest this needs more research and more patients to fully examine the possibilities. I agree with this. Small sample sizes just aren't enough to get conclusive results. At the American Dental Association meeting in New Orleans last week, the folks at DenMat announced an interesting new impression product called SplashMax. While I do the vast majority of my impressions digitally thanks to our iTero scanner, we do still take traditional impressions for some cases such as a crown under an existing partial denture. Because of that, I was intrigued with SplashMax… especially the low contact angle that the material can provide. So take a look at the contact angle graphic below (prepare to be impressed) and then read the Press Release that I received regarding SplashMax. 10/31/13 Lompoc, CA: DenMat, a leading manufacturer of innovative esthetic dentistry and advanced oral health solutions, introduces SplashMax, a premium quality VPS impression material. SplashMax features an improved formulation over the award winning Splash® impression material, with instant hydrophilicity, maximum tear strength, excellent dimensional accuracy and high contrast colors. SplashMax provides detailed and consistent results at a highly competitive price. In independent testing, SplashMax achieved a lower contact angle within seconds and a much higher tear strength than other leading impression material brands. These physical properties, combined with a 99.9% recovery after stretching and compression, result in highly detailed, accurate impressions with fewer retakes. SplashMax is available in four high-contrast viscosities (Extra Lite, Lite, Medium, Heavy) with two distinct set times (2:15 and 4:30). For greater convenience, this product is available in two delivery systems; an easy-to-use 50mL Cartridge and a 360mL Jumbo Cartridge. All SplashMax products have a patient-pleasing Wild Berry scent. For more information about SplashMax contact DenMat by phone at 1-800-4DENMAT (1-800-433-6628) or visit us online at www.denmat.com/splashmax. DenMat manufactures a broad range of cosmetic, restorative and clinical product solutions, available in the U.S. and over 68 countries worldwide. Innovative products and new distribution partnerships continue to position DenMat in the forefront of the dental industry, from Lumineers®, the most patient-requested thin veneers in dentistry, to innovative diagnostic and clinical solutions including Velscope® and PeriOptix®, as well as industry brand names like the Flashlite Magna® 4.0 curing light and Perfectemp® Temporary Crown & Bridge materials. The DenMat Lab is recognized as a leading laboratory for both minimally invasive and traditional-preparation restorations, while DenMat Education offers Continuing Education programs internationally, including Destination Education events. For more information, visit www.denmat.com or call 1-800-4DENMAT (1-800-433-6628). For dentists who are tired of waiting for their tray adhesive to dry, Cosmedent introduces new KWIK, a fast drying tray adhesive that dries kwikly, in less than a minute. When it dries, the material is non-sticky, yet it has formed a very tenacious bond to the impression material to insure that you will get an accurate impression. KWIK Tray Adhesive is for use with addition silicon materials only. Helium balloons float right? It's all about the physics. Helium is less dense than air, so Helium rises & provides enough lift to keep a balloon aloft. Similar thinking (not floating, but density) has created a new hard drive from Western Digital. The new Ultrastar He is a device that is filled with… you guessed it… helium. The ideal makes pretty good sense. Since helium is less dense than air (14% less dense actually) there is less friction on the platters that spin inside the hard drive enclosure. That means that less power is needed to run the drive and because of that, an extra platter can be added. HGST delivers the world’s first hermetically sealed, helium hard drive, the Ultrastar® He6 for massive scale-out environments. Why does helium make a difference? Helium has only one-seventh the density of air. Replacing air with helium inside a hard drive dramatically reduces the turbulence caused by the spinning disk, cuts power consumption and results in a lower temperature within the disk drive. The reduction in turbulence for the spinning disk allows HGST to offer a seven-disk design in a traditional 3.5-inch form factor. In addition to being the world’s first helium-filled hard drive, HGST Ultrastar He6 is also the first hard drive in the industry to offer a 6 terabyte1 capacity. This design offers a 50% capacity gain and still reduces the energy needed to run the drive by up to 23%. HUDSON, OH — August 6, 2013 — Wolters Kluwer Health, a leading global provider of information for healthcare professionals and students, announced today that Lexicomp® Online™ for Dentistry featuring VisualDx® Oral was recently awarded the "Best of Class" award for dental technology products by the Pride Institute. Each product honored with this recognition features unique characteristics that differentiate it from the competition in a compelling way and, more importantly, creates value for the general dentist. The Pride Institute's "Best of Class" Technology awards were launched in 2009 as a new concept to provide an unbiased, non-profit assessment of available technologies in the dental space. Now in its fifth year of awards, Pride Institute has named Lexicomp Online for Dentistry featuring VisualDx Oral as one of those lauded "Best of Class" in dental technology products. Lexicomp Online for Dentistry provides industry-leading reference information and screening tools to help answer prescribing, diagnosis and treatment questions. Dental professionals can help enhance patient safety by accessing dental-specific pharmacology information on over 8,000 prescription drugs, OTCs and natural products, plus tools like an unsurpassed drug interactions screener. "With the VisualDx Oral feature, Lexicomp Online for Dentistry allows dental professionals to not only research drug information, but to also build a differential diagnosis on common and rare oral lesions based on visual cues, symptoms and patient history," shared Dr. Lou Shuman, DMD, CAGS, Best of Class founder and President of Pride Institute. "Lexicomp Online for Dentistry continues to advance the dental clinical practice with the latest in technology coupled with top-notch pharmacology information," commented David Del Toro, Vice President & General Manager, Clinical Drug Information, Wolters Kluwer Health, Clinical Solutions. "As such, we are honored to be recognized by Pride Institute and its elite panel of members spanning the dental community." One of the really fun things I get to do every year is to be part of the expert panel that determines the winners of the the Pride Institute Best of Class Technologies. One night in Chicago in February during the CDS MidWinter Meeting, the panel meets (usually around 10:00 or 10:30 pm) in a secret location and we debate, cajole, and sometimes argue about what we consider to be the best there is. A few hours later, we have our list of winners and they are featured in the Pride Expo area in the exhibit hall during the American Dental Association Annual Session. All the winners are locate in the Pride Expo and meeting attendees can meet the companies, see the winning technologies, and get all the details of why they were chosen as winners. It's always an honor to be on the panel and always fun to help choose the winners. This is truly a responsibility that we on the panel take extremely seriously. We know that lots of doctors base their purchasing decisions on who we choose… and we are proud to help improve the practices of those folks.